For as long as people have worn jewelry, there have been sellers out there to supply and facilitate production for and distribution of diamonds. Each year the demand for diamonds grows, as more and more consumers want to acquire these precious stones. Over the centuries, a complete distribution network has been designed for diamonds being mined from the ground and processed to get into the hands of retail consumers. The major obstacle has been a cumbersome supply chain process, as raw stones pass through multiple stages of production before arriving as a final product in a retail showcase exhibit. The challenge in the past for diamond sellers has been that in every stage of the production process there results in additional costs such as including currency conversion, insurance, security and paperwork. Additionally, there is opportunity for theft, fraud or simple human error at every stage. Consequently, in the past, each step of the process was built on trust. Trust in the integrity of whom you were doing business with and trust that you are getting what you paid for. All this comes at a price to everyone in the diamond supply chain. The implications for a process not reliant on trust for transactions for a supply diamond chain is that it would revolutionize the diamond industry. Most costs associated with intermediaries would be eliminated as would most opportunities for theft, fraud and human error associated with paper based transactions. Other cost benefits would be the reduction of insurance premiums, security and errors and omissions. Blockchain technology would also expand the diamond market in general. Diamond sellers through a diamond blockchain would now have the opportunity to leverage technology by listing diamonds directly on the blockchain and have direct access to any consumer anywhere in the world. The positive implications for this are incredible. How would this be done? Certified diamonds on the blockchain could potentially revolutionize the entire diamond supply chain and the “Trustless Transactions” would provide greater efficiency and margins to sellers. Imagine the economic implications of being able to list your diamond directly on the blockchain and instantly make it publicly available to anyone in the world. Retail consumers would have direct access to all the properties of the diamond including size, color, weight and cut. Additionally, photos and authentication certificates would also be available. This reduces the requirements for centralized intermediaries, which in turn should result in reduced costs for both sellers and buyers, leaving a bigger margin despite lower prices. It’s a win-win for both parties involved in the transaction. 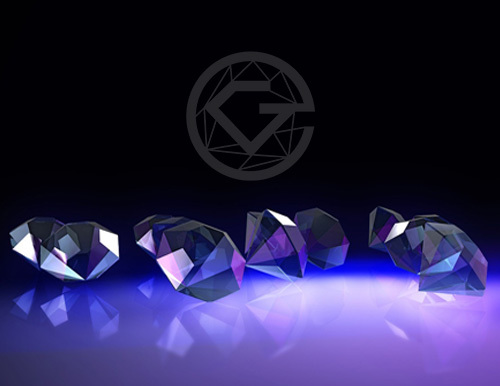 GLITZKOIN intends to implement blockchain technology to achieve this goal by developing a diamond blockchain platform. We believe that decentralizing the diamond supply chain will lead to more cost effective, secure, and easier to track and trace transactions. We are confident that this will have substantial benefits to both buyers and sellers of diamonds a,s the economic efficiencies of the supply chain results in lower prices for the consumer and better margins for sellers. GLITZKOIN has a seasoned professional diamond team with decades of diamond industry experience. We have brought aboard some of the most seasoned and talented blockchain and crypto currency experts, to develop and manage the Stellar based blockchain platform.